My time in Kenya so far has been an intense learning process – both in the classroom for the first few days, and then working with our groups of entrepreneurs. I’ve gained insights into the process of creating an idea, solving a business problem and then testing your assumptions. However, one of the most important journeys for me has been to understand our roles as facilitators. Coming into my first session I was anxious to impart all the knowledge I had just acquired. 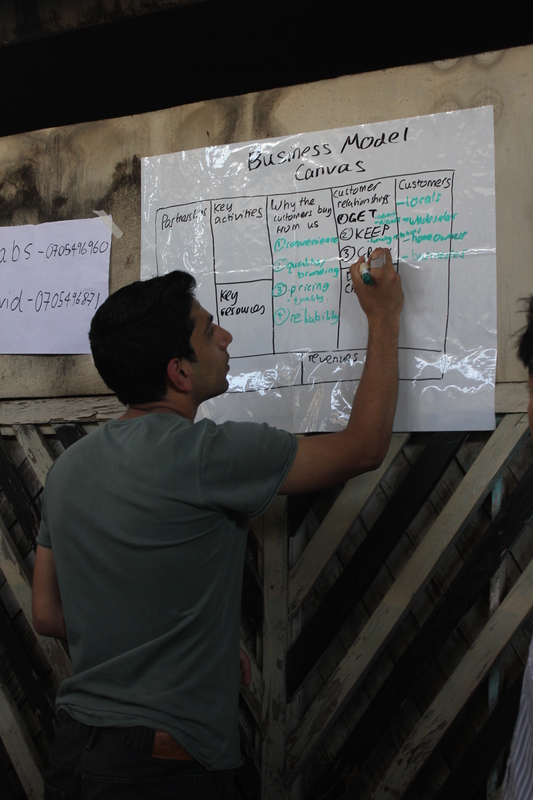 The BMC (Business Model Canvas) is an excellent tool that concisely portrays the key parts of the business and their linkages. Having mastered this, I felt I was ready to instruct. The groups loved the tool and immediately saw the use of applying it to their businesses. As sessions progress, I’m beginning to realise that instruction is becoming facilitation. It’s no longer the case that I have set tools to teach my groups; instead my role has transitioned: I need to unlock the vast pool of knowledge and creativity that these guys have at their disposal (especially for those already running their own businesses). The more I think about this concept, the more I realise how significant the power of facilitation can be. Over the past few weeks we’ve been working with James, who owns a shoe shop that sells new shoes on the third floor of the prime plaza in town. Our questioning of James around the choice of his location has led James to come to a key realization; he would get more contact with customers if he sold his shoes on the street where the footfall is greater. Our discussions around the choice of his product have now also led him to consider changing his stock to second hand shoes, which have a lower margin but a much larger demand in Nakuru due to their lower price. The key part of this process has been that James made the decision on his own terms. All we did was to ask him the right questions. This, in my opinion, is the key to being a good facilitator – provoking independent thought that challenges assumptions. I’m convinced that the better I do this, the more progress my groups can make over the next three weeks. Great post. I like your point about asking the right questions. Where does he currently source his stock from? The mitumba industry frustrates me in that it prevents the development of any local manufacturing, this article gives a summary – http://www.csmonitor.com/2001/0220/p7s1.html/(page)/2. There is also a question over it’s long term sustainability – http://www.coastweek.com/3607_49.htm. Just some thoughts on a sticky question. Nb – My Bata plimsoles are still in pretty good nick since I got them in Nakuru in September for what that’s worth! Thanks for the links and great to hear the plimsolls are holding up!